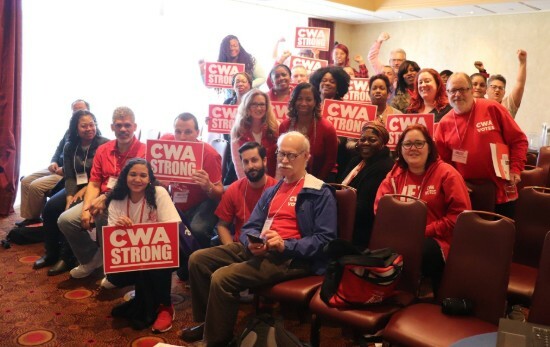 Over 750 Shop Stewards representing locals across New Jersey gathered in Atlantic City at the end of March for the largest two-day state conference ever held for CWA Stewards in New Jersey. The conference's theme? The Path to CWA Strong. Through workshops and breakout sessions Stewards were trained on how to hold in-district lobby meetings with their state legislators and developed a worksite action plan to engage their co-workers on the fights ahead. Stewards are gearing up to fight for a fair state budget that includes a millionaire's tax, and fight proposals championed by State Senate President Steve Sweeney's "Path to Progress" report that attack public worker pensions and shift billions in health care costs onto public workers. Day one of the conference opened up with a poignant reenactment of voting and civil rights activist Fannie Lou Hamer by Helen Sims, of the Fannie Lou Hamer Civil Rights Museum in Mississippi. State Senator Chris Brown welcomed Stewards to the City, followed by an address on national politics by CWA District 1 Political Director Bob Master, along with a discussion on how CWA is fighting back against attacks on the middle class from the Trump Administration. CWA Local 1040 President and National Executive Board member Carolyn Wade followed up with a talk on the CWA Strong program and how we're fighting attacks on our union rights.